Candles scented with warm spices or yummy sweets are so satisfying to have setting out as the weather gets cooler. I love to burn candles and have that pleasant aroma filling the air as I go about my work. Displaying those candles, so that they are just as pleasing to look at, can be a fun decorating project. 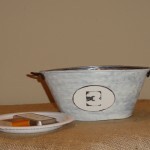 I like to look around for interesting containers or plates that I have around the house and can upcycle. 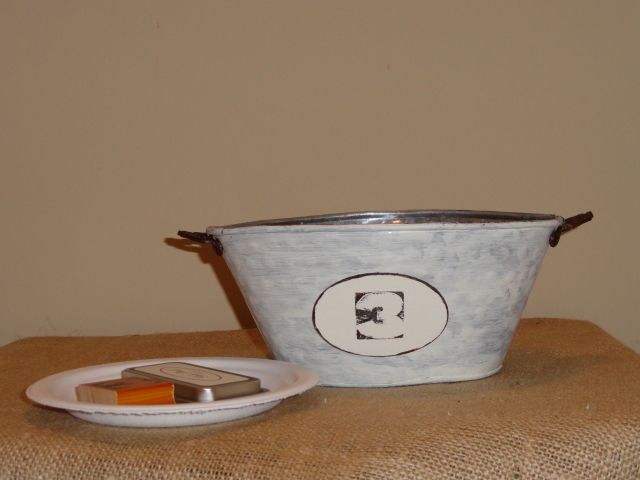 For the featured candle, I used a metal bucket that I had received some bath products in as a gift. 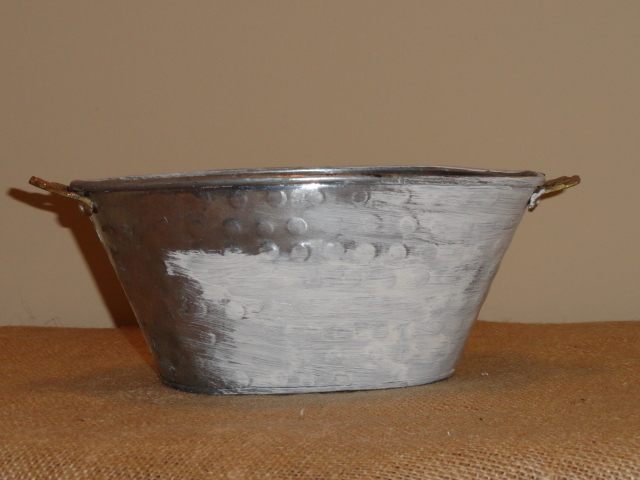 The metal was a bit too shiny of a silver to fit in with the rest of my decor so I would have to make some changes – which meant I would get to play with paint! 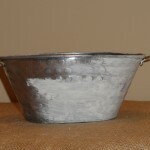 For starters, I applied a thin layer of ivory acrylic paint over the entire container. This took care of the shine and gave me a good base to work from. I then played around with my metallic colors of copper, pewter and gold to come up with a finish that had warm and festive Fall colors and also looked like an older rust covered bucket. There is just something I like about old! I painted over the brass handles in a warm metallic umber paint to go with some of the browns in my room and still have a natural metal finish look. Since numbers are big in decorating right now, I decided to paint an oval woodsie and stamp it with a vintage looking number three. Then, I just adhered it to the side of the container with some good ole tacky glue. This picture was taken before I began smearing on the metallic paints. Next time I would apply the woodsie after all of the painting was complete so I wouldn’t have to work around it. Now I could add my candle to the center and surround it with some colorful and festive potpourri. 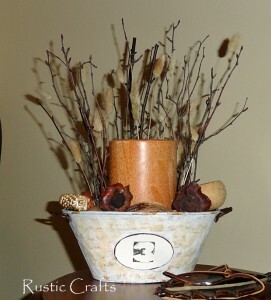 The potpourri included a couple of pumpkins just right for the season! Holy fire hazard Batman! I put it together so carefully and stood back to admire my work and even took a picture…..and then DUH!! I can picture lighting a flame to that candle and the nice surrounding branches would be perfect kindling. Not such a good idea. However, if you don’t light your candles, I suppose this could work. Some candles are super fragrant without being lit!